Below is a guest post by Brad Parks and Zach Rice from Aiddata and William and Mary. They discuss results from a survey of 640 Policymakers and Practitioners in 100 Developing Countries (edit: survey is here). Wealthy countries and international organizations have created a wide range of policy instruments—incentive-based aid programs, moral suasion tools, and financial sanctions—to spur and sustain reform efforts in developing countries. The Heavily Indebted Poor Countries Initiative and the Multilateral Debt Relief Initiative make the provision of large-scale debt relief conditional upon the implementation of macroeconomic and public financial management reforms. The U.S. Government’s Millennium Challenge Account provides additional financial assistance to countries that meet certain eligibility conditions, such as the adoption of liberal economic policies and the administration of free, fair, and regular elections. The World Bank, the Asian Development Bank, the African Development Bank, and the Global Environment Facility have introduced similar performance-based resource allocation formulae. Governments and international organizations also lean heavily on moral suasion tools, such as the World Bank’s Doing Business Report and the State Department’s Trafficking in Persons Report. However, there is relatively little evidence about the conditions under which these policy instruments are most effective. Scholars are divided on the issue of whether these external incentives and pressures are effective at spurring and sustaining reform efforts in developing countries. One camp of political scientists and development economists questions the wisdom of external actors using conditionality or socialization tools to influence the domestic affairs of sovereign governments. Another camp argues that external actors can make a substantial contribution to global development by creating financial incentives and social pressures for poor countries to establish domestic institutions that do not require continued external support. These groups have developed a range of data sources and quantitative and qualitative methods to support their competing arguments. Yet neither camp has devoted much effort to surveying policymakers and practitioners who work on the frontlines in developing countries. It is usually assumed, rather than demonstrated, that policymakers and practitioners in the developing world would prefer to eliminate or minimize aid conditionality and other programs that make financial or reputational rewards conditional upon policy performance. In the fall of 2012, we worked with a team of researchers at the College of William & Mary’s Institute for the Theory and Practice of International Relations to conduct a survey of 640 development policymakers and practitioners from 100 low income and lower-middle income countries. We asked survey respondents to identify—from a list of 14 possible reforms—three changes in the way foreign assistance is allocated and delivered that they thought would be most beneficial. Policymakers and practitioners did not express the same aversion to aid conditionality and selectivity that one observes in some quarters of the research community. Respondents identified “eliminating all forms of conditionality” among the least desirable changes to foreign assistance policy. Additionally, much of the conventional wisdom about “what will make aid more effective”—including the streamlining of administrative reporting requirements, the provision of forward-looking aid expenditure information, and a reduction in the practice of “tied aid”—did not enjoy strong support among survey respondents. 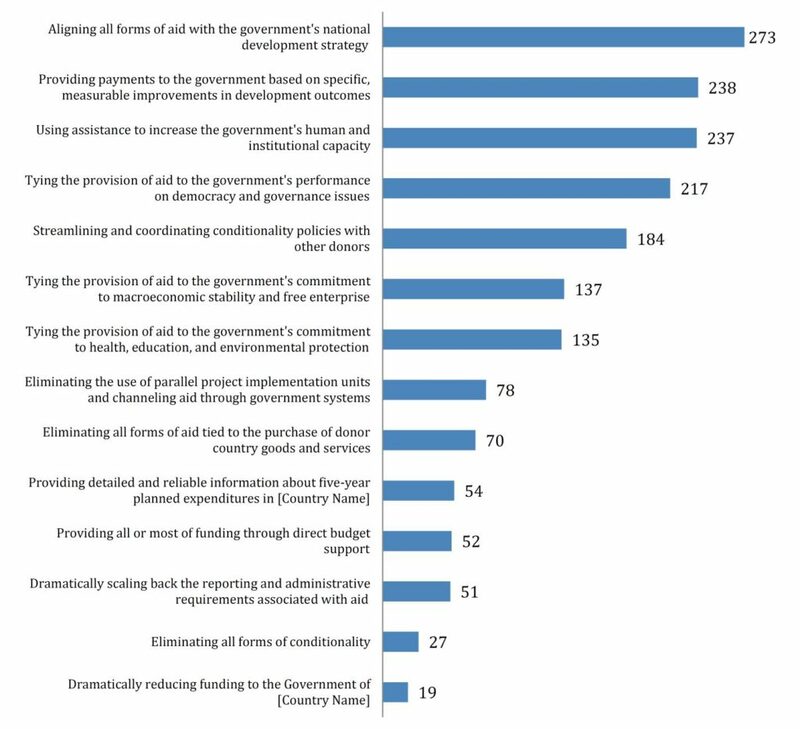 Some of the most popular ideas for reforms included conditioning the provision of aid on democracy and governance issues and the use of results-based aid delivery modalities, such as the Center for Global Development’s Cash on Delivery proposal. Respondents also identified “streamlining and coordinating conditionality policies with other donors” as one of the top five foreign assistance reforms that they thought would yield positive results. More information about the findings from this survey can be found on the Making Reform Incentives Work for Developing Countries project website at http://www.wm.edu/offices/itpir/reform_incentives/index.php. A 127-page report, including data on the policy influence of the Millennium Challenge Account (MCA) and the determinants of success and failure in Millennium Challenge Corporation (MCC) Compact and Threshold Programs, can be found here. Bradley C. Parks is Co-Executive Director of AidData and Research Faculty at the College of William & Mary’s Institute for the Theory and Practice of International Relations. Zachary J. Rice is a Project Manager and Survey Methodologist at the College of William & Mary’s Institute for the Theory and Practice of International Relations. Really good stuff, Brad and Zach. Supports the contention (expressed by James Vreeland and others) that there are reformers in government who want to use policy conditionality in order to get things done. I have to say that I find the high support for democracy and governance conditionality a little surprising. I would be interested to hear more from the policy makers’ perspective about exactly what they think that means and why they favor it. I’m an IPE person and just got back from six months in Afghanistan, and a curious thing happened to me there. People with incredible first hand experience of the situation there would take me behind closed doors and vent to me at the stupid, wasteful, and ineffective policies that they were expected to implement. These were very smart people, but they weren’t being listened to and they saw me as somebody who could get their story out. 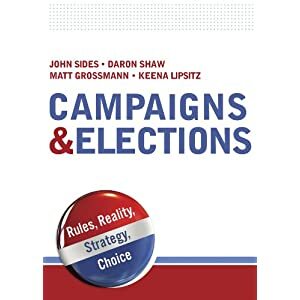 After reviewing the past ten years of US policy in Afghanistan at the time, blood, and treasure expended as compared to the results achieved, I suspect these people indeed are correct and have a better perspective than those who implemented US policy.